One of the nicest features of the High End is its diversity. Regardless of whatever trend is fashionable, there will always be manufacturers to buck it, and sell alternative concepts and sounds. VMPS is just such a case. With few exceptions, the recent trend in speaker systems has been toward small-to-medium-sized "monitors" with good imaging and high resolution, but limited bass and dynamics (footnote 1). The VMPS SuperTowers provide the former, but buck the trend by adding reproduction of the deepest bass and outstanding full-range dynamics. 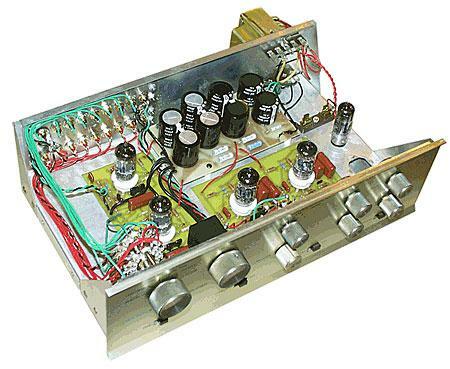 If I had to pick one amplifier designer as having had the greatest continuing influence on the high-end market, as much as I admire John Curl, Audio Research's Bill Johnson, and Krell's Dan D'Agostino, the name of David Hafler inexorably springs to mind. Not because he challenged the very frontiers of hi-fi sound, but because he combined a fertile, creative mind (footnote 1) with a need to bring good sound to as wide an audience as possible, both by making his products relatively inexpensive and by making them available as kits. (The Major Armstrong Foundation apparently agrees with methey presented David with their "Man of High Fidelity" award at the summer 1988 CES.) It remains to be seen if the Hafler company will continue in this tradition, now that David has sold it to Rockford-Fosgate. But there is no doubt that many audiophiles were first made aware of the possibilities of high-end sound by Hafler products in the late '70s, and by Dynaco in the '60s. As the person who "invented" subjective testing, I have followed with great interest the many articles in the mainstream audio press which purport to prove that none of us can really hear all the differences we claim to hear, particularly those between amplifiers. My reaction has usually been: "Why didn't they invite me to participate? I would have heard the differences under their double-blind listening conditions." I could make that assertion with supreme confidence because I had never been involved in any such test. DatelineChicago, May 30, 9:00pm. Exploding fireworks lit up the sky above the Chicago river as 200 leading high-end designers gathered in the Hotel Intercontinental for Stereophile's 30th Anniversary banquet. After a repast of four gourmet courses and five wines, the time came for after-dinner speeches to celebrate Stereophile's past and high-end audio's future. Publisher Larry Archibald described his adventurous transition from the high-end car business to risky publishing. 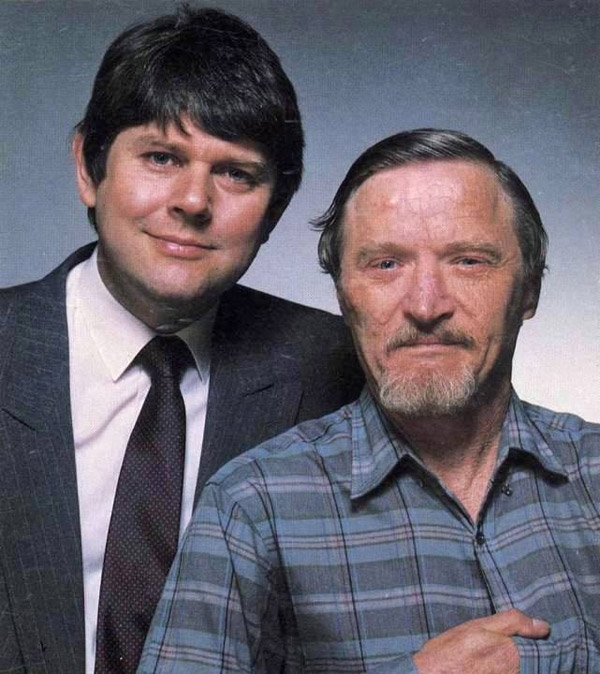 Introducing J. Gordon Holt, he praised JGH's uniquely lucid writing and his unflinching insistence that equipment designed to reproduce music should be judged on its ability to do just thatthe unconventional view that launched high-end audio. 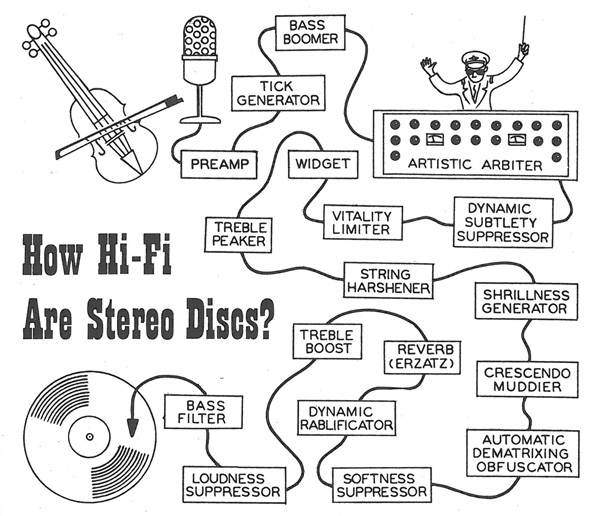 How Hi-Fi are Stereo Discs? Ralph died last week (September 11, 1991), his great and faithful heart stopped in the aftermath of an affliction not too uncommon for older, larger dogs—a gastric torsion. He was approximately 12 years old. The Dalhquist DQ-10 loudspeaker has not as yet been formally submitted for review. (The designer tells us he is still working on the low end.) We auditioned a pair at the one local dealer we could find who had the DQ-10s on demo, and were immensely impressed. Obviously, Jon Dahlquist is on to something that other speaker designers have been overlooking, for, despite the multiplicity of driver speakers in the system, the DQ-10 sounds like one big speaker. There is no awareness of crossovers or separate drivers (except at the low end, about which more subsequently), and the overall sound has a degree of focus and coherence that is surpassed only by the Quad full-range electrostatic, which don't go as low at the bottom or as far out at the top. Thirty-five years ago this month, the first issue of a new audio magazine—cover price 50 cents—cautiously made its way out of a Philadelphia suburb. Its black'n'white cover featured a chessboard adorned with tubes and XLR plugs. Its 20 advertising-free pages included a feature on how to write an ad for an audio product, which had been penned by one Lucius Wordburger, a footnote helpfully pointing out that this was the nom de plume for one J. Gordon Holt, "who wishes to remain anonymous." The March 1999 issue of Stereophile is my last as the magazine's Equipment Reports Editor. I have accepted a job elsewhere in the industry, and, as a public relations consultant, will be actively promoting this wonderful hobby of ours in a different capacity. It's not often that you get a chance to have extensive discussions with the horse's mouth, but we recently had that opportunity. 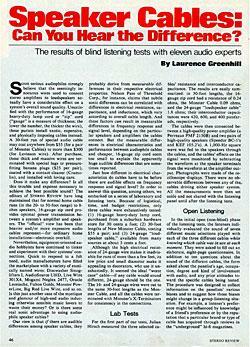 Since July of this year there has been extensive discussion in the audio community, particularly the high-end segment, of Larry Greenhill's article on speaker cable listening tests in the August, 1983 issue of Stereo Review (footnote 1). From recent talks with author Greenhill we've learned that the most interesting story was not in Stereo Review; instead it can be found in the varying reactions from different quarters, and what they say about the high-end industry in general. The rumors have been flying, and his arrival is imminent—a couple weeks after you read this—so it's time our readers know: John Atkinson, for the last four years Editor of Britain's prestigious Hi-Fi News & Record Review (left), is joining the staff of Stereophile as Managing Editor and International Editor. 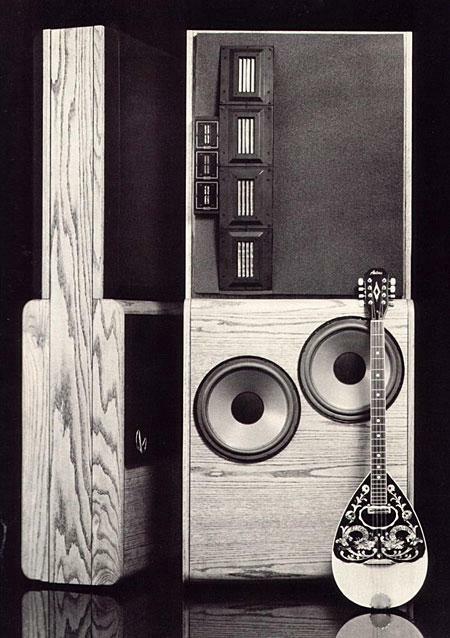 Ever since Vol.6 No.3 was published in August of 1983, Stereophile has been the leading subjective review magazine in terms of circulation. At that juncture our circulation was 12,000 and has now increased to 15,000. And it's all your fault! There are certain manufacturers for whom every new product implies the promise of countless modifications, Usually a month or so apart, culminating inevitably in a version so far removed from the original that it must be assigned a new model designation—usually a letter suffix ranging from A, to D. By the time E is envisioned, another CE Show is approaching, so the decision is made to give the unit an exterior facelift and a brand-new model number. Presto! A new product for CES. I'll say one thing right off about the Infinity RS-1B: It sure looks as if you're getting your money's worth.